Capoeira is a Brazilian martial art that combines elements of dance, acrobatics, and music. One important component in Capoeira is acrobatics; see how this segment of the art enhances overall performance. 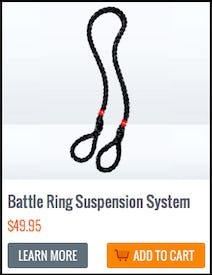 The Capoeira acrobatic chain is an art form in and of itself containing many different categories, but in the end it has its own style and uniqueness. Different people seem to express themselves better through different types of this acrobatic way of moving. There are acrobatics of static balance, acrobatics relying mostly on flexibility and mobility, and explosive movements like flips. There are many combinations of these actions and new ways are constantly being introduced. The movement vocabulary of Capoeira contains hundreds, if not thousands of moves. Many authors have tried to list them all, an impossible project for the following reason. If you try to narrow down the main constituents of it, the biggest part of Capoeira has to do with various handstands, elbow levers, and a variety of bridges—all with different ways to move in and out of position. Note that these are only the main tools of the trade. Add to that various hand spins and many more esoteric moves, all connected to movement going from the floor, up to the air, and back to the floor. This gives you the ability to put together sentences in movement, which are as numerous and diverse as the ones you can literally speak out of your mouth. Many chains of Capoeira movement contain the same building blocks of moves. These movement chains look so different to the untrained eye that you could not tell that they all have the same common denominators. Most people would not understand what they have seen at all, and plainly attribute it to different bone structure of the performer or other “magical powers” they possess. Capoeira acrobatic movement has an elegance in the length and fluidity of the moves, though it could also incorporate high dexterity in changing directions and chopping moves up. 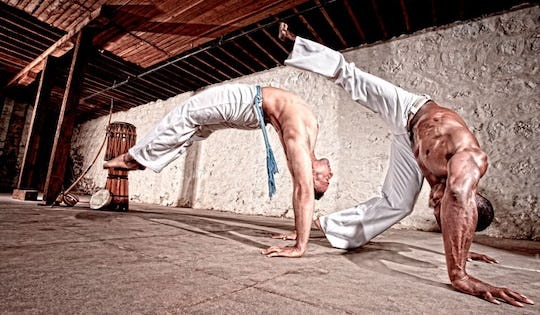 The purpose of acrobatics in Capoeira are to allow the Capoeira player to move in any direction from any position, and as such, to give the player a more advantageous position. It can also help him get out of tough situations. The Capoeira game calls for high creativity at its highest level of performance. But then again, the art form of Capoeira acrobatics also took on a life of its own when, since the seventies, you see it being used more and more by solo performers. They present their movement skills regardless of using it in an interaction and many times lack the ability to use it as so, which does take away part of its dimension. I do find that becoming sufficient in handstands, bridges, elbow levers and explosiveness, specifically with good technical kicks, gives one the general ability to more easily figure out most Capoeira acrobatics. People who lack some of these attributes may have a harder time accomplishing these various moves. I also believe that these qualities enhance most people who engage in high level sports for the mobility gained, the explosiveness, the relative to body mass strength, and the strengthening of many weak links such as the posterior shoulder and the lower back. With acrobatics you can articulate every joint and every muscle in the body. Through movement, the student can express slow twitch muscle fibers for control and stability and fast twitch ones for faster and more explosive movement. Through this type of practice the body learns to recruit a bigger percentage of the muscle fibers in comparison with most other physical activities. Therefore, the control one has over his body as a result of this occupation is king in the field of movement. Acrobatics develop mobility, various categories of strength and endurance, speed, power, coordination, and balance. From a more personal perspective, it is hard to describe the sensation of creating the inertia to fly through the air. That feeling of supremacy over gravitational control that envelops the body regardless of the other forces working through it, or the fine-tuned meditational sensation after staying and moving on a one arm handstand for some time. Similar to how this looks, the feeling is unreal. Of course we are dealing with testosterone and other compounds that gives the feeling of elation similar to other sports, which is the reason people engage in them. While it is hard to compare the different reasons for this type of feeling, the amount of relative strength to body mass is comparable. While learning to become a decent acrobat of any type is a long process that shapes the mind as well as the body, I have prepared a few practice protocols that could give you the first steps into this realm. What’s the deal with the black guys head in the thumbnail pic. I tilted the picture and his head looks wrong….Photoshop error or what? Are these meant to be done in progression or in one workout?